A notebook recording the world's first attempt to write down the rules of football is to go on display at the British Library in an exhibition devoted to the beautiful game. 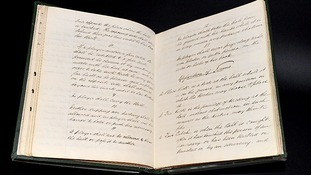 The 1863 document, which is worth £2.5 million, contains notes from a series of pub meetings between the "founding fathers" of football in which they agreed on 13 original rules. Those initial meetings led to the creation of the Football Association, which is celebrating its 150th birthday this month, and the FA Cup. FA chairman Greg Dyke said the document's importance "cannot be underestimated" and that it "offers the public a glimpse into the origins of the nation’s favourite game". The display, which runs from today until 17 December, also includes a 1930s referee book with 20 diagrams explaining the offside rule, and another offering advice on the "football temperament".